Team Atos made history by winning their first ever team World trophy last weekend, marking the end of Alliance’s ten-year run championship dominance. Atos took an early lead in the first two days of the competition with solid medal hauls along the blue and purple belt divisions. On the final day of the tournament and midway through the male black belt divisions, the teams stood only one point apart. 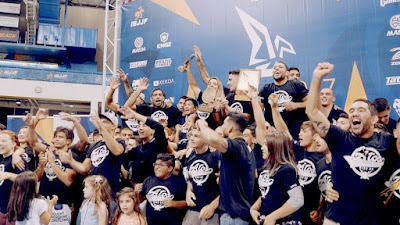 With gold medal performances from Atos stars Andre Galvao (medium heavyweight) and Erberth Santos (super heavyweight), and only silver medals for Alliance athletes Marcos Tinoco (middleweight) and Bernardo Faria (super heavyweight), Atos were able to claim the trophy for the first time in the team’s short history. Formed by Andre Galvao and Ramon Lemos in 2008, the team has always had a strong focus on competition. 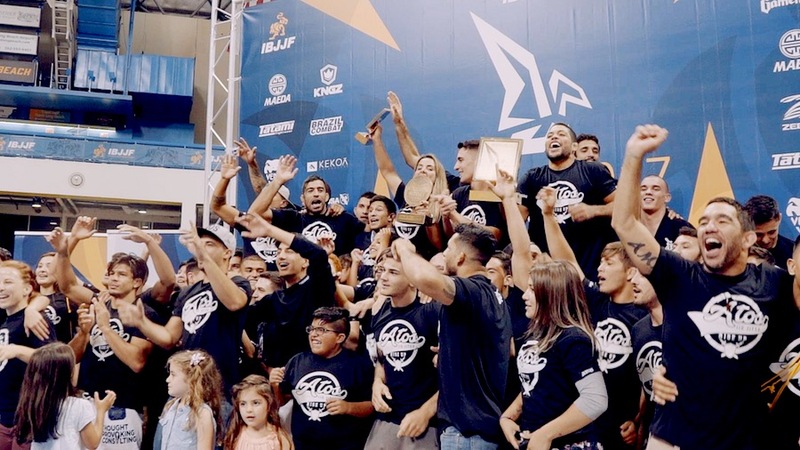 With their team HQ in San Diego and flagship locations such as the Mendes brothers’ Art of Jiu-Jitsu academy in Costa Mesa, the team enjoys a strong presence in Southern California but has associated gyms around the world. Atos claimed the trophies for male and juvenile competitors. The majority of the Atos competitors who contributed to the juvenile trophy came from Art of Jiu-Jitsu, with a deep squad of highly-disciplined and talented young athletes displaying the AOJ patch, including many from the Believe and Achieve sponsorship program. The Atos juvenile team was so successful; they had almost three times as many points as the second place team.